Pulian professional manufacturing Shredder Machine manufacturers, are: plastic injection machine mill, Blow Molding Machines peripheral equipment. Pulian in Recycling Machinery years of experience, in particular: plastic Recycling Machinery areas. Shredder Machine particularly suitable for crush: Foam Rubber, Rubber Blended Foam, Recycled Rubber Products, Plastic Sheet, Acrylic Products, Plastic Extruder waste, plastic injection machine, and other plastic waste. 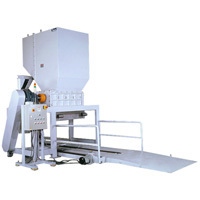 Shredder AG series is low speed and small horsepower is of shredder. Shredder 3 blades and 4 blades of rotor design on the Twin shaft. Shredder has top quality of blade. The blades is K340 Germany made. Shredder is performed as for heavy duty cutting. Shredder design cutting angle that with less vibration and minimized powder. For plastic waste, waste, domestic electronic waste, furniture, paper, leather and other huge waste, evenly to shred as unique. Twin shaft reverse rotation, generate a super tensile force and torque to reach the shredding function. The tooth blade is suitable in customized design.